What is a Grain Pump? Barry Smith's grain handling and storage system was the first ever Hutchinson Grain Pump installed in Australia and it was completed in late 1997. Skyway Grain Systems designs maximum storage protection for all types of grains by using the best bin manufacturer's products in every handling system they design. Since every project, be it pulses, corn, or wheat, is unique, Skyway uses the Supplier that manufactures the equipment best suited to your needs. For systems designed for commercial grain storage, Skyway designs system around bulk storage bins manufactured by Sukup, Grain Guard, and Westeel. 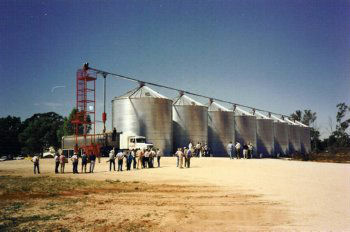 Every Skyway farm storage design utilizes grain silos from one of 4 suppliers, Sukup, Grain Guard, Meridian or Westeel. Sukup, Grain Guard, and Westeel being of the galvanized boltogether grain bin variety and Meridian being the smoothwall all welded together hopper bottom bin variety. All of the grain storage equipment Skyway offers is from world class manufacturers that set the standard in Grain Bin manufacturing. The reason for Skyway to offer a variety of didfferent brands is to meet the preferences of our customers – lots of customers may already own a certain type of grain bin and would like to continue with that brand. Whichever Grain bin is used in your storage system Skyway will ensure that it suits your needs and is engineered for your purpose. Please see individual pages giving detail of each of these Grain Bin lines and the variety of product offerings that Skyway can offer you. A complete line of galvanized bolt together hopper bottom bins are available from either Sukup or Westeel. Diameters range from 15’ (4.5 meters) to 36’ (11 meters) and capacities from 2000 bushel (55 MT) to 65,000 bushel (1,770 MT). Both are offered in a medium duty or commercial series. With the Merdian smoothwall hopper bottom storage bins Skyway supplies top quality grain and seed storage at prices comparable to corrugated hopper combos. Without bolts and ribs, the Meridian seamless interior allows for safe and easy unloading, while ensuring no seed or contaminates are trapped on the walls or joints. Completely self-cleaning with no obstructions, Meridian hopper bins are the safest and most efficient grain bins available. You will appreciate the quality and safety of Meridian Grain Max storage bins, and the time and energy saved handling grain in a smooth-wall bin. Meridian Grain Max hopper bins feature all the standards you expect from a Meridian Built product–industry leading design advancements, material selection, and premium powder coat finish. Whether it is storage for grain, seed, feed (steep cone), liquid, pellets, cement, or whatever product you need to store Skyway works with Meridian to match you with the storage that will meet all of your needs and requirements. Meridian builds smooth walled hopper bins that ensure free flowing product with minimum clean-out. Meridian built Fertilizer Bins are the most versatile, multi-purpose hopper bins available today. Used most often to store and handle fertilizer, grain, feed and seed, their versatility extends to coal, sand and any other free-flowing, dry granular commodity. Grain Max hoppers offer top quality grain and seed storage at prices comparable to corrugated hopper combos. Without bolts and ribs, the Grain Max seamless interior allows for safe and easy unloading, while ensuring no seed or contaminates are trapped on the walls or joints. Completely self cleaning with no obstructions, Grain Max bins are the safest and most efficient grain bins available. You and your family will appreciate the quality and safety of Grain Max, and the time and energy saved handling grain in a smooth-wall bin.